And for those new to the South Sound -- you're in luck; the Tacoma Rainiers, the Triple-A Affiliate of the Seattle Mariners, play at Cheney Stadium in Tacoma and open their season at home April 9. Mariners management made a difficult decision this winter rebuilding the organization, trading away franchise players for valuable prospects that push Seattle's contention window into the future. The Rainiers are at the forefront of the Mariners' moves. Many young players are poised to see major-league time in the near future and spend time in Tacoma first. But don't just view the Rainiers as a showcase for big-league baseball talent. The top team in Seattle's farm system serves as an excellent option for a night out. With several group packages and family meal plans, the Rainiers cater to all fans looking for an incredible baseball experience. For families, Cheney Stadium is more than a ballpark. Remodeled in 2016, the Rainiers opened the Mary Bridge Children's Family Pavilion, highlighted by a whiffle-ball field and cutting-edge playground. The best part -- the Pavilion is open year-round. The Pavilion is always open to the public, but can be rented on game days, creating an outstanding destination for parties, groups and other events. In addition to conventional ballpark concessions, the Rainiers have partnered with Little Caesar's and Chick-fil-A to provide family meal packages. Both promotions offer tickets and meal vouchers at discounted prices one Saturday and Sunday per month, respectively. And let's not forget about value. Last season, tickets for reserved section seating were just $13.50 at the gate. All military members receive a $1 discount at the ticket office, but prices drop even further if purchased beforehand. Reserved seat pricing falls to $11.50, and spots in the outfield grass are $7.50. To honor our military, the Tacoma Rainiers host an annual Salute to Armed Forces game to recognize those who have served. 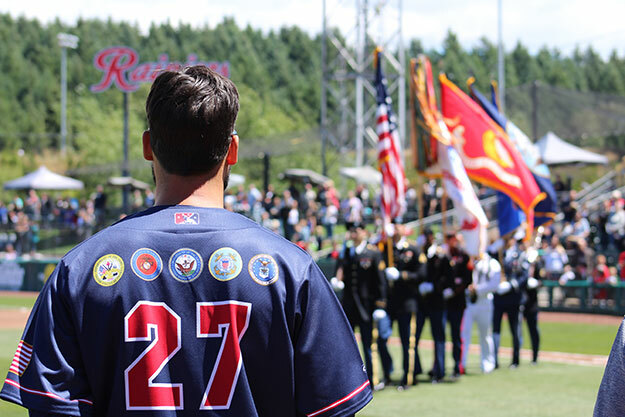 This season, Salute to Armed Forces Day is Sunday, June 23, at 1:35 p.m. Players wear military-themed jerseys, complemented by a silent auction held during the game. The Rainiers have served as a cornerstone of Tacoma sports since 1904. But now, soccer fans in the South Sound also have a reason to rejoice. Over the offseason, the City of Tacoma introduced two professional soccer teams, both joining the Rainiers in calling Cheney Stadium home. The Tacoma Defiance, the reserve team of Major League Soccer's Seattle Sounders FC, were renamed from Sounders FC 2 and began playing in Tacoma in 2018. Cheney Stadium will additionally house Reign FC, one of the nine teams in the National Women's Soccer League. Previously known as Seattle Reign FC, the team announced a relocation to Tacoma in January. With the Tacoma Rainiers and the welcoming of two professional soccer clubs, Cheney Stadium will host roughly 100 events between the months of March and October. The Rainiers will be as exciting as ever. The franchise is younger, faster and energetic, with several highly-touted prospects making their season debuts in Tacoma. Be sure to look out for top-ranked Mariners prospect Justus Sheffield, a starting pitcher acquired from the Yankees last November. He won't be in Tacoma long, though. Baseball is here. The beautiful Pacific Northwest sunshine is here. The Mariners -- and Rainiers -- are showcasing the bright future of the organization. For those in Tacoma -- enjoy.